My best friend, a 30-year-old native New Yorker, has just discovered eye shadow. Not just any shadows, but more specifically, matte shadows. She’s got a point. So exactly when do you shimmer and when don’t you shimmer? I realized that I haven’t really addressed this question before. In fact, it seems that most women are generally not “into” matte, since it seems as though it is not as publicized a finish as shimmer. Or maybe lots of women just don’t have much experience with it. Here are a few pointers on matte textures, since this year, the matte finish is proving to be an up and coming trend that might just stick around! Matte eye shadows, right off the bat, are always a great idea for daytime makeup. They are also ideal for older women or for someone who has wrinkles or is experiencing a loss of elasticity in their skin. Matte finishes, at times, might appear to have a darker tone, since the light does not reflect off it. Rather, it recedes. Keep this in mind when purchasing medium-to-dark colors, even with matte foundation formulas. You might also have to “build” the color, or layer it, depending on the pigmentation. Nudes-to-light browns are always a great option, anytime. On the luxe side, you can the try matte eye shadows from Trish McEvoy. If going to the drugstore is more convenient for you, check out NYX matte eye shadows. The best kind of brush to apply the shadow is a short and firm one, as opposed to a fluffy blending brush. The fluffy brush is best served for other application steps. Make sure you tap off the excess product before applying it, and if possible, do your eyes before foundation if dealing with dark colors. You don’t need makeup fallout all over your cheekbones. For this look, you will need to prime your eyelid better than ever. There are different kinds of primer: ones with shimmer and ones that are more matte. Lean toward the more matte ones. De-crease and lightly dust with a loose powder before applying your shadow. If the primer is too wet, and you apply the powder, you risk ending up with a muddy mess! Shimmer, Glow and Pigments: These illuminating products allow for radiance. Whether you want a sheer wash of shimmer or an intense application of vibrant color, shimmers come in all kinds of textures and finishes. Some shimmers are more satin, while others are more glittery. Some are liquid and others are powder. You can experiment to find which ones you like, but overall, I would choose a satin, which is a nice medium, Check out Color Tattoo Pure Pigments from Maybelline, since there are subtle as well as vibrant pigmented selections. I also love the wearable color selection. I did come across a dream palette if there ever was one — a perfect combination of satin and matte eye shadows. 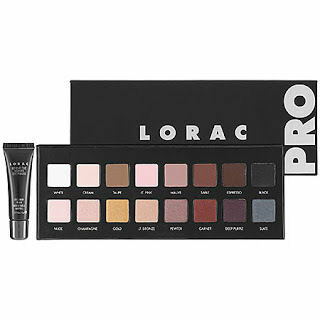 It’s Lorac’s Pro Palette. The packaging is sleek and lightweight, and the colors are so flattering, enabling you to start with a light matte day look and end up with a glowing or dramatic evening look.